Admescope solidifies its strength as the drug-drug interaction service by launching new non-CYP inhibition assays. The new services are validated for evaluating inhibition towards carboxylesterases (CES1/CES2) and aldehyde oxidase (AOX), which complements our portfolio for non-CYP inhibition services launched earlier this year. All the non-CYP inhibition assays are available using recombinant enzymes with specific substrates and LC/MS/MS endpoint, delivering IC50 values. See Table 1 for more information about enzymes, substrates and obtained IC50 values. Furthermore we have earlier established inhibition assays for various glucuronosyltransferase (UGT) enzymes; UGT1A1, UGT1A4, UGT1A6, UGT1A9, UGT2B7 and UGT2B15. 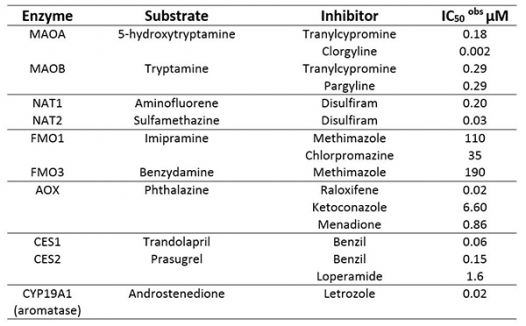 Is there any additional enzymes you would like to have inhibition services for? Please let us know and we will do our best to cover your needs. Contact us for your suggestions or for more information.